Before you get started on this walk-through, you might want to check out this Quick-start Summary . This walk-through will familiarize you with the basic tasks of setting up your producer profile and uploading a product that you have already created into Adobe Exchange. When you log in to the Producer Portal for the first time, you see the Account page, where you provide information about yourself as a producer. If you need to change or add to this information later, choose Account from the drop-down menu in the upper right corner. This page has sections that show your current Profile and Twitter information. Click Edit Profile to set up your Producer name and email address, a brief description of yourself or your company, and your company’s support email address. The bottom section of the Account page allows you to integrate with Adobe Exchange’s social presence by associating your Producer account with your Twitter account. If you want Adobe Exchange to automatically follow your own activity, click Edit details in the Twitter section to set up your Twitter handle and hash tag. When you set up this association, each product that you create is automatically given its own Twitter hash tag, which you can edit if you choose. Adobe Exchange then tweets about every new product that you publish. If you choose to Follow @adobeexchange, you get tweets about new product publications, new featured products, the top downloaded product for each day, the top grossing product for each week, and the number of users that download products each week. 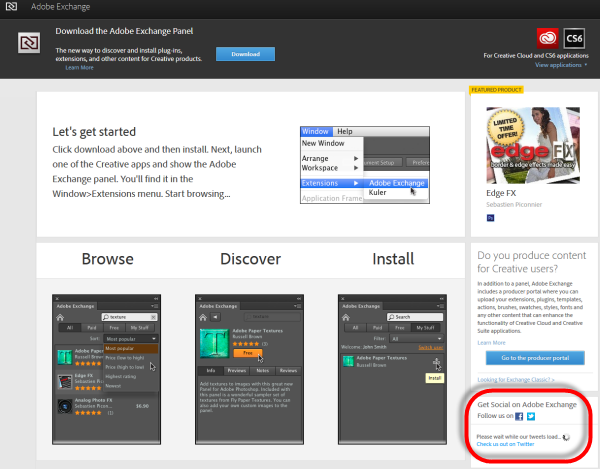 The Twitter stream also appears on the Adobe Exchange consumer landing page (https://www.adobeexchange.com). Before you start to upload a new product, you must decide whether you plan to publish it to the world, or will share it only with a private group of users. If you decide to mark a product as private, you will not be able to change this decision. 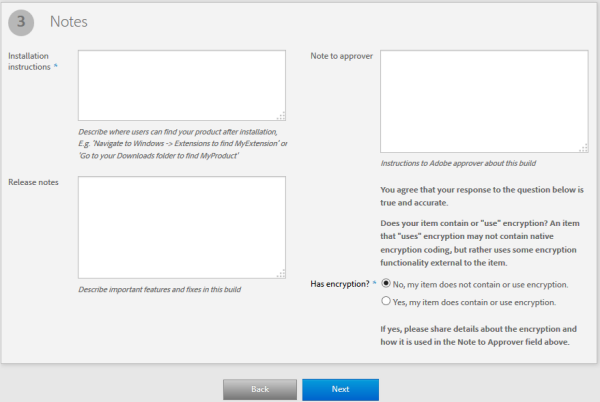 If it is a public product, you can still share it with your testers before you submit it to Adobe for approval. In order to offer any kind of content as a product in Adobe Exchange, you must package it into a single file. For CS6 versions of the host applications, all products must be packaged in the ZXP format. This is the format that Adobe Extension Manager uses to load content into Creative Suite applications. If you have a simple file (such as an image, a brush, an action, or a template file, for example), you can submit that directly without packaging it. However, we recommend using the Online Packager tool to package it anyway, to ensure that it gets installed in the right place. If you have a set of simple files, you must compress them and submit the ZIP file. If you have a product in the form of an executable, you can submit the EXE or APP file. You can also add executables to a zipped package. To add a Lightroom Plugin package using the Online Packager tool, you must first zip the package, keeping your package’s internal folder structure intact. For example, “myplugin.lrplugin” becomes “myplugin.lrplugin.zip”. The online Packager automatically unzips “.lrplugin.zip” files before adding them to the ZXP, providing a seamless installation experience for your users. There are a variety of easy-to-use tools for packaging extensions and panels in the ZXP format, which you can obtain through the Producer’s Portal. Configurator 4 : This tool, oriented toward designers, helps you create new Flash panels and palettes for Adobe applications. It includes an Export Wizard that steps you through the process of packaging the panel you create. Adobe Exchange Packager : If you extend an Adobe application with a C/C++ plug-in, or some combination of an Extension and an application’s plug-in SDK, you can use this general tool to package the result. An online version of this tool is now available from Producer Portal when you try to upload a new product. You should make sure that your ZXP package conforms to the specifications of Adobe Exchange. For full details, see How to Package a Product for Adobe Exchange. To start defining you new product, go to the My Products tab and click New Product. Enter information about your product. Required fields are indicated with an asterisk. Publisher defaults to the Name you specified in your Account Profile. Purchase type : Select Free, Perpetual, or Subscription. If you select Free, your content is offered as a Free product, or is shared privately; users can download and install it without making any payment. 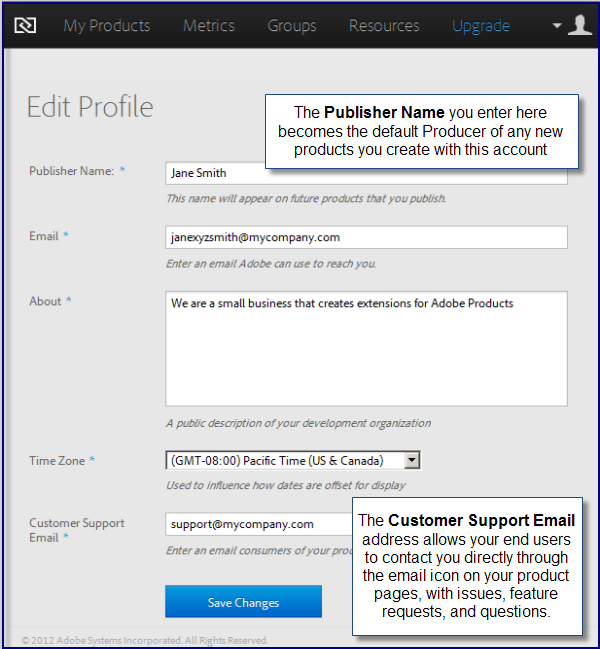 You can upload more than 2 paid products only if you have a subscription to the Adobe Exchange Portal. For more about paid products, see Creating Paid Products for Adobe Exchange. If you select Perpetual, the user will have to pay one-time fee in order to obtain your product. If you select Subscription, you can choose to for your product subscription fee to be charged monthly or annually. Private : If you plan to make your product available publicly, leave Private unchecked. Once you make a product private, you cannot change it to public. If you are sharing the product privately, you must have already created the group of users with whom you plan to share it; for details, see Sharing Products. Add Tags : You can select up to 8 tags from the drop-down menu that will be matched in searches. 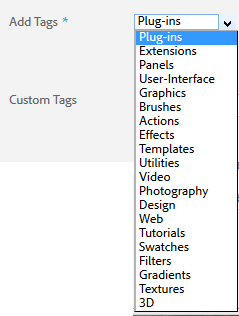 Custom Tags : If the tag you want is not available in the list, define a new tag, or a set of tags separated by spaces. (Note that if you enter a comma, the comma becomes part of the tag string. When you have finished entering the new tags, click Add. Choose which applications your product is compatible with. Enter a version number for your product. If you need to package multiple files, choose Create a new package, and add files to your package. For more information about creating packages, see Packaging your Product for Adobe Exchange. Provide descriptive information for your product. Required fields are marked with an asterisk. Installation instructions : You must provide information for end-users about how to get to your product when it is installed in the host application; for example, what menu item invokes it. 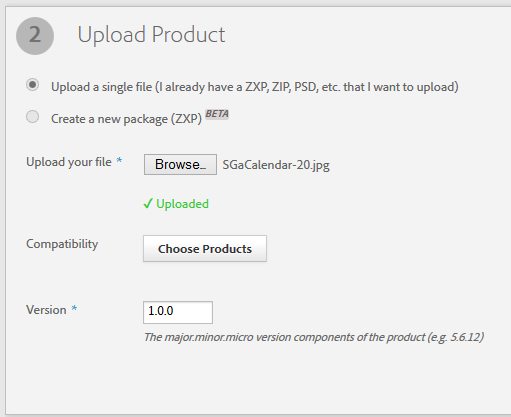 Non-ZXP products are automatically placed in the Downloads folder. Has encryption? : You must specify whether your product contains or uses encryption. If you do use encryption, you must provide details in the “Note to approver” section. Click Next to submit the intial draft of your product configuration. This uploads the package containing your product build. If there are problems with uploading a ZXP package, check that the build was properly packaged; see Common Errors. It is helpful to provide images so users can see and learn more about the capabilities of your product. You can supply different images, which are displayed in various contexts. You can add a Product Icon, which represents your product when a user searches for it on the Creative Cloud Add-ons website or in the Exchange Panel. 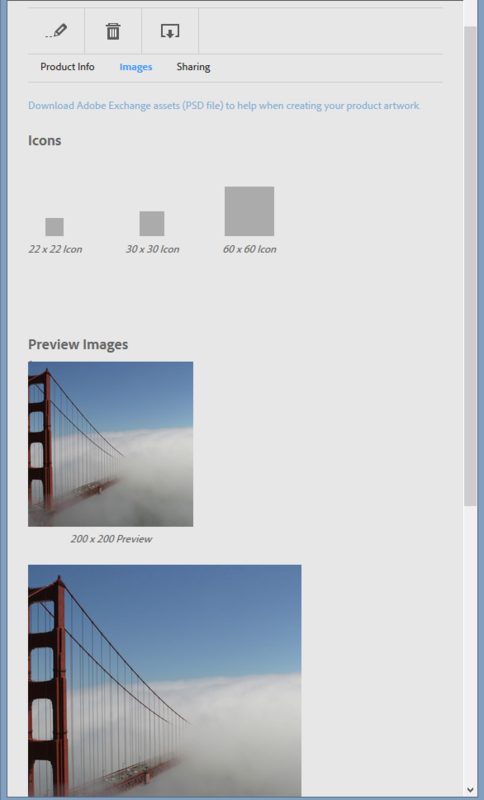 You can add up to 5 Preview Images, for use in various contexts, with or without captions. 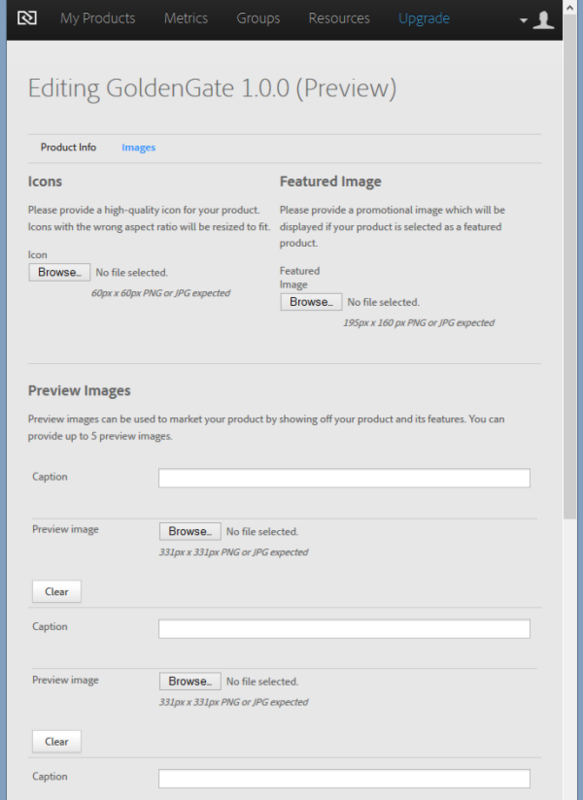 You can also specify a larger Featured Image, which is used when your product is chosen as a featured product. When you first upload a new product, you go directly to the page on which you can add images. To edit your marketing assets later, click the pencil icon to edit the product, then click the Images tab. Browse to each of the image files you wish to use for Icons, for the Featured Image, and for the Preview Images you wish to associate with your product. Be sure to choose PNG or JPG files of the recommended sizes in each case. See Creating images for your products. There are 5 slots for Preview Images, but you don’t have to use all of them. You can choose to add a caption that describes each Preview Image. Each image is uploaded when you select it. When you have specified all the files, click Next at the bottom of the page to continue editing the product. The images you have selected appear in the product Images page. They are automatically resized for the different contexts in which they can appear. 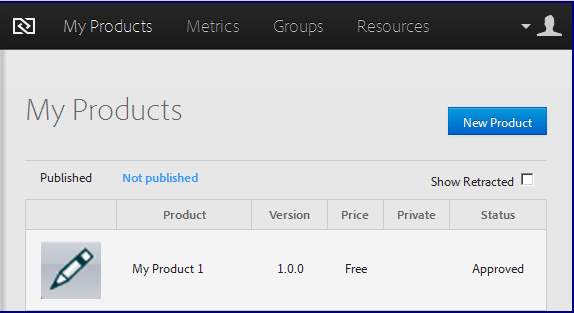 When you have successfully uploaded all assets, the new product appears in the My Products/Not published list. You can view and edit the product details by clicking it in the Not published list. 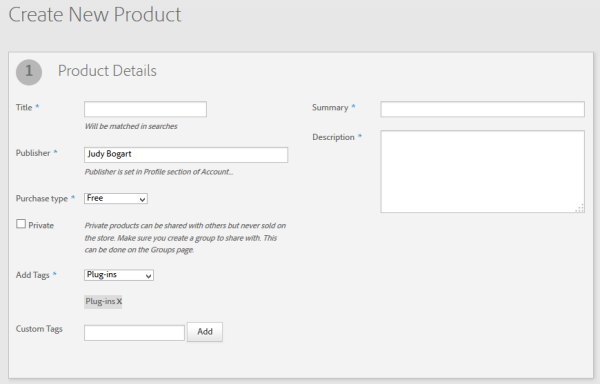 This takes you back the Product Info page, where you can continue to refine the product configuration. 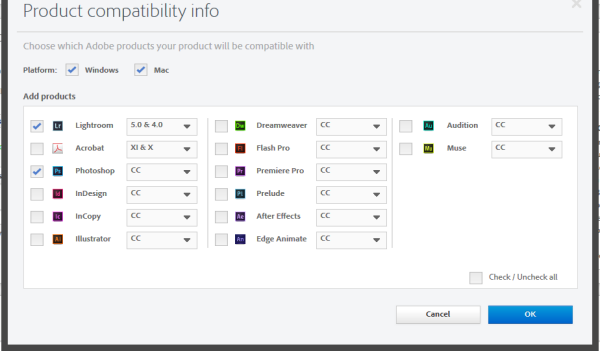 To see the result of your product configuration choices, you can preview your product offering in the Adobe Exchange panel that is integrated into the CC application in which your product runs. Download the Adobe Exchange Panel from the Resources page. 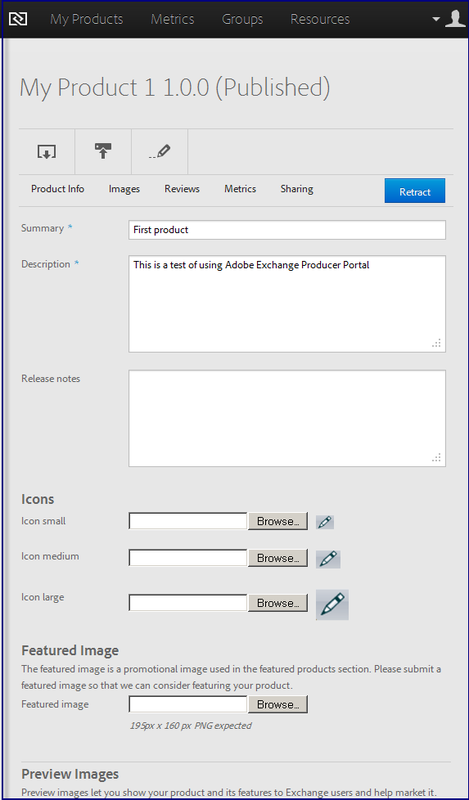 Use the Adobe Extension Manager to install the Exchange Panel in your target application. Open the Exchange Panel by choosing Window > Extensions > Exchange. Double click your product entry to show the product info. Check that the images and text look the way you expect, in both the narrow and wide panel views. Download the product and install it to make sure it works as you expect. If you want to have other people help in testing, share your product with those people before submitting it for publication. You have to create a group of users before you can share the product with them. For details, see Sharing Products . 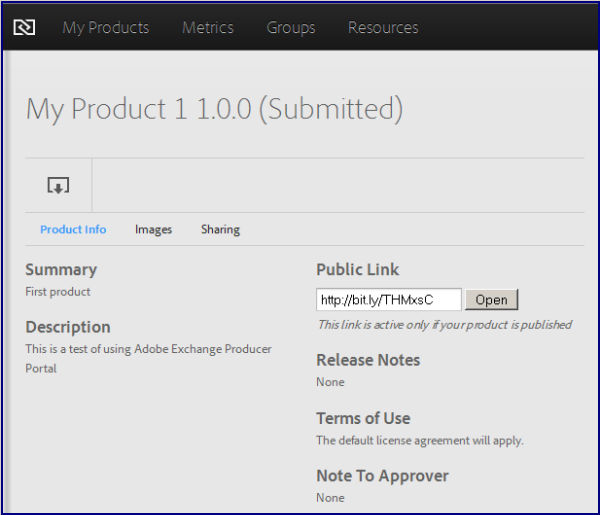 When you are happy with your product definition and have tested it in the Exchange Panel, you can submit the draft to Adobe for approval. See the Approval Guidelines. Before submitting your draft, be sure to check all of the details (such as compatibility, keywords, and descriptions) very carefully. Once you have submitted your draft for approval, you cannot make any more changes in the product or configuration until the product is either approved or rejected by the Adobe team. Submit : This button starts the approval process, but allows you to maintain control of when to publish the approved product. 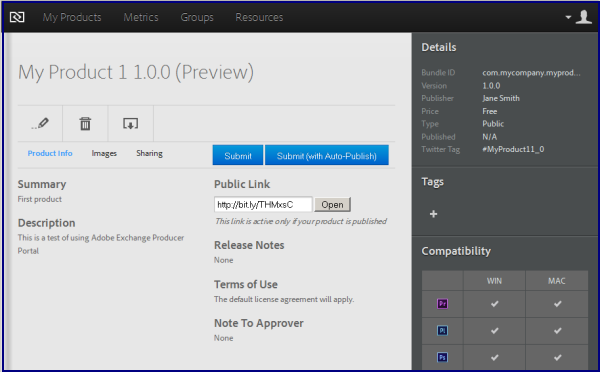 Submit (with Auto-Publish) : This button automatically publishes the product as soon as it receives approval. Once you have started the process, the displayed status changes to “Submitted”. You receive an email notification confirming your submission, and another notification when the product has been approved. You can also check the status in the My Products list to see whether the approval process is complete. If you have chosen the auto-publish option, you will see the product appear in the My Products/Published list as soon as it is approved. If not, you will see the status change from Submitted to Approved. 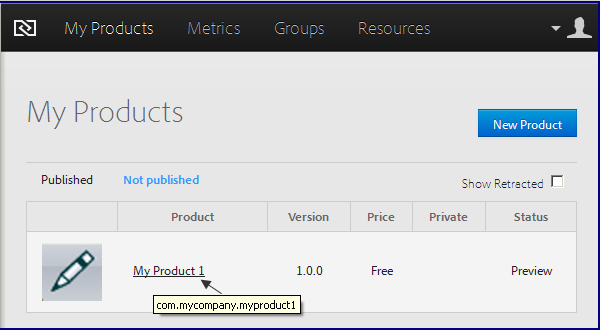 To publish it, click the product in the Not published list to go to the Product Details page, and click Publish. The Publish button changes to Retract, and the new product now appears in the My Products/Published list. After a product is published, you can make changes to the configuration in order to create patch releases and updates. See Managing Products after Publication. All changes that you make after publication must go through the same approval process as the original submission. 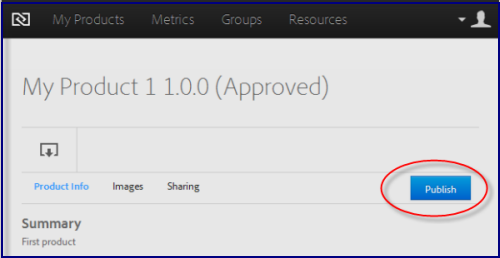 To make changes, go to the Product Details page for the published product and click Change request (the upload icon). This brings you back to the page where you edit the product details. You can choose to temporarily retract your published version if you have an important update, such as a bug fix. Click Retract to withdraw the published product until you can submit the new version. An icon for the product has not been uploaded. To publish the product, you must associate it with a product icon of the propert size and format. To upload the icon, open the Product Info page, click the Images link, click Edit, then upload a PNG or JPG image of the proper size and click Save Changes. An image file uploaded exceeds the 400K limit. It is too large to be uploaded to the service. The product does not have a summary or description associated with it. To move a product to preview status or publish the product, you must provide this text. To add a summary or description, open the Product Info page, click Edit, then enter the appropriate text and click Save Changes. You have not enabled your account to sell products via the FastSpring service. Without the key, you may only publish free products. To enter your FastSpring key, click on your name at the top of the page, select Account form the menu, fill in your FastSpring Key and click submit. Make sure to enter your FastSpring key, and NOT your FastSpring password. For more details on FastSpring and selling products, see the resources article, How to Create a Paid Product":https://www.adobeexchange.com/resources/2. There is already a ZXP uploaded to the system that has the same bundle ID as the ZXP just submitted. A bundle ID is most likely to conflict with a product you have already uploaded, but it might conflict with another developer’s ZXP if the bundle ID is fairly simple (such as.“myextension” rather than “com.mycompany.myextension”). The uniqueness of the bundle ID is checked against published, unpublished, and retracted products. The title intended for the product submitted is already in use by another product. The name of products must be unique to avoid confusion for users. The ZXP uploaded exceeds the 2 gigabyte limit. It is too large to be uploaded to the service. This error message can apply to several areas, but generally means that the group name, partner name, or product title has a leading or trailing space. The email address provided does not match email conventions. The email address(es) submitted to a group were not added. Most likely the address(es) were not added because they don’t conform to the proper format for email addresses.